R ep. 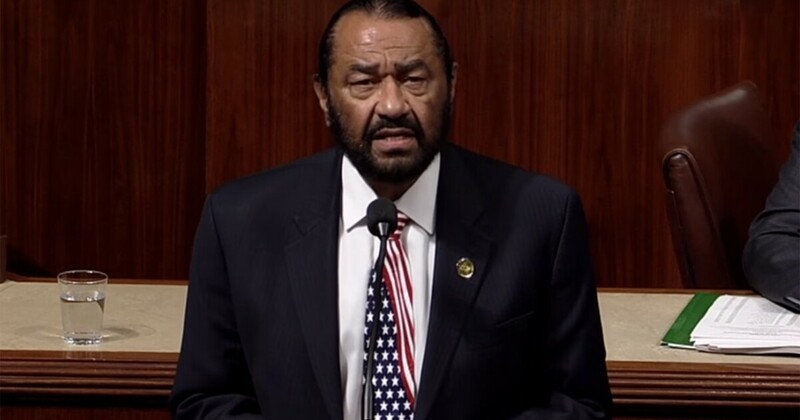 Al Green, D-Texas, wants to punish President Trump. Bad. And sometimes ridiculous. Texas Democrat so eagerly wants that he often uses what is happening in the news cycle for the moment to claim that the time to punish Trump is now . No matter what happens: Rep. Green will find a way to tie it back to his obsession with punishing the current president. This single-minded pursuit of impeachment has, of course, produced some particularly absurd moments for the congressman, including when he claimed this week that the chaos in Virginia is further evidence that Trump must be countered. You read this right: Three Democrats in Virginia are in trouble, so it means that the Republican President is leaving the office. The fact that Virginia's democratic governor, Ralph Northam, and its democratic lawyer, Mark Herring, have not yet withdrawn, despite admitting to wearing the blackface when they were younger, is only a symptom of a major syndrome, which is currently plaguing our country as a result of failing to act on President Trump's bigotry, argues Green this week. 9659002] Green argued that Northam and herring have been emboldened to descend their scandals "largely because the Trump presidency has sent a message that you can be immune to the consequences of bigotry by daring them with authority and power "Constantly remove you from the office." "We are no longer staring at bigotry; bigotry is now staring us down," added the congressman. accusations of political hypocrisy if we refuse to join a bigoted president. "In December 2017, Green demanded a basic vote on objects of persecution. The measure was supported by a whole 58 democrats. In January 2018, he demanded another fight against voting. He was supported by 66 Democrats then. It is unclear when he plans to go to a crime hat trick in this current congressional session. Some Virginia Democrats, especially Virginia Legislative Black Caucus, have asked Northam to resign. They are not wrong to ask for it. A little back, the way where Northam has handled this scandal is reason enough to resign. Forget the old, stupid pictures of him in the blackface and / or the Ku Klux Klan regalia. in fact, he first apologized, then withdrew his apology and denied inclusion in the picture and then held a press conference, admitting to wearing the blackface on a completely different event in the mid-1980s, showing that the man is both staggeringly incompetent and amazed. He shouldn't trust a book of fighting, let alone the governor's mansion. But for Green, Northam repurchase is not enough. Trump should be impeached! "The treatment must be more than talking about a much needed conversation about bigotry," he argued for challenging Trump. "We can't allow bigotry to go unchecked." I give this to Rep. Green: Man's message is remarkably uniform, though it is idiotic.